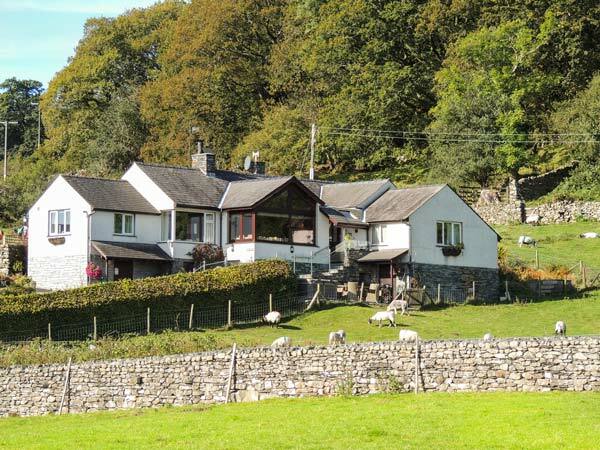 This walk starts in the lovely village of Coniston by the lake of the same name, and is particularly suited to anyone staying there. Tarn Hows is a very well known Lake District visitor attraction. What is less well known is that the tarn used to be three smaller ones called High, Middle and Low Tarn. In 1862 James Marshall gained the land and set about building a dam to raise the level, and with other landscaping largely created the Tarn Hows we see today. Later he sold it to Beatrix Heelis, better known as Beatrix Potter, who eventually passed it to the National Trust for safe keeping. There is a small amount of road walking on the return journey which can be avoided by simply retracing the outward leg. Parking in Coniston village is limited and gets very busy at weekends and holiday times. Belted Galloway cattle may be found around the tarn during the winter months. Walk out of the village on Tilberthwaite Avenue, heading towards Hawkshead on the B5285. Just over the bridge on the outskirts of the village bear left onto the permissive bridleway signposted "Tarn Hows 2-1/2 miles" which is separated from the road by a thin hedge. Follow this round, bearing left at the Waterhead Hotel, and again bear left at the road junction at the head of Coniston Water. The bridleway rejoins the road again outside the entrance to Boon Crag Farm, and the National Trust office. Continue on the road for just 20m (22 yards) and bear left onto another section of permitted bridleway again separated from the road. Go through the gate and cross the minor road to continue on the permissive bridleway signposted "Tarn Hows 1mile" opposite. This starts climbing through woodland and is a relatively rough track. Reaching a track coming in from the right bear left. The signpost here has "Tarn Hows" scratched into it by a passer-by. In 150m (165 yards) bear left again onto a track signposted properly here: "Tarn Hows". This track drops left and crosses the river then climbs gently and sweeps right in a lazy zigzag. At the car park cross the road to the tarn. It seems that most people go round the tarn clockwise. Having crossed the road and followed the graded path down, in front of you is a splendid viewpoint. Bear left and drop down to the wide gate. Go through and follow the path around the tarn. Things to look out for include at least three trees, or tree stumps with coins embedded in them. Also we were very pleased to discover a small patch of Bog Myrtle, and a juniper bush covered with lots of berries. There was at least another decent stand of juniper as well. Keep bearing right, and remaining on the main circular path. Back at the viewpoint bear left to head back to the road. Here you have a choice. You can return the way you came via the bridleway through the woods. Alternatively turn right and take the minor road back to where the permissive bridleway crosses this road. This latter option does have merit. It drops through woodland, with a stream, some tall bracken lining the steep road sides, and is really rather picturesque in places. Good views too across the fields. So that's what we'll describe here. So turn right onto the road. Go across the cattle grid, and indeed you may find cattle from here. Continue on the road as it sweeps left, passes the turning to Tarn Hows Cottages, and descends down through woods. Just before meeting the main road, at the junction you crossed earlier, turn right and go through the gate onto the permissive bridleway. Continue to Boon Crag Farm entrance, along the road there for 20m (22 yards), and bear right again on to the permissive bridleway. Follow that all the way back to Coniston.